In my childhood, I loved the excitement of a typhoon. I loved how we would all huddle together for hours; how the rain would pound and the wind would scream while we waited inside the sturdiest structure we could find. They came every year—four, five, or six times— and were a recurring fact of life. They came. They passed through. Life went on. I live in Los Angeles and on the afternoon of November 7, 2013, I was on the phone with my brother Rommel. I could hear fear in his voice. He is forty-one years old, confident and hard working, and I had never heard his voice have that quality before. Rommel was right—where could they go? There really was no place—no structure in the town was more sturdy than my parents’ house, which was two stories, made of cement and hollow blocks—one of the few houses in town that was not made from flimsy native materials. Living in Guinob-an as the storm approached were my mom and dad, Tarcila and Loreto Llevado, my brothers Ronedo, Danny, Sonny, and Rommel—each with wives and children—and my sisters Eva and Lina. Two other sisters, Emma and Rowena, were on the island of Antique, with their families, also directly in the path of the storm. Three remaining sisters were safe from the storm—Alma was in Manila, Liza was in Kentucky, and I was in California. We are twelve siblings—and with children and spouses included, altogether there were over fifty Llevado family members in Guinob-an in the path of the storm. I looked up the storm on the Internet and what I saw put a knot in my stomach. The weather forecast said that the storm called Haiyan internationally and Yolanda in my country, was heading directly toward Guinob-an. It would make landfall in nearby Guiuan to the east, then cross the Leyte Gulf with the upper right part of the eyewall—the worst part of the storm— hitting our town before moving on to Tacloban, then continuing across the Visayas, the central islands of our country. Filipinos everywhere were nervous. There was talk that this might be the strongest storm in recorded history. And it was heading for my tiny town. To all our friends and family in the central Philippines and especially in Lawaan, Eastern Samar—we are REALLY thinking about you and praying for you as typhoon Haiyan approaches. Please be super-cautious and careful. CNN is saying that it is among the biggest and most destructive storms in history with winds currently of 190MPH making it a Category 5+. . . Rena has been on the phone a lot the last 24 hours. I know everybody in the Philippines is an expert, one way or another, at getting through typhoons—but this one really seems to be different. Please take precautions and be extra careful, and know that we’re thinking and worrying about you. Don’t underestimate this one. I talked to Rommel about supplies. The family had a 50-kilo sack of rice which, under normal circumstances, would last several weeks. But now there were more mouths to feed than usual. All of my brothers and sisters living in Guinob-an and their families were gathering at the home of my mother and father, or nanay and tatay as we call them in our language. Theirs was one of a small handful of sturdy homes in Guinob-an—a two story, hollow block construction, cemento na balay, built by my brothers with materials that my sister Liza and I purchased over several years, sending money from our work abroad in America, little by little. But that was just my parents’ house. The houses of my brothers and sisters and their families were flimsy—far too flimsy to survive. Some were simple bahay kubo—square native thatch houses—and others were made of ragged combinations of plywood, thatch, and corrugated roofing. “Nanay has her asthma medicine. Tatay’s blood pressure medicine is almost finished,” Rommel said. My mother’s asthma had plagued her throughout her adult life, and my father’s high blood pressure was a constant worry. “Waray na,” he answered. It’s gone. It was another thing to worry about. Rommel is diabetic and needs his insulin. It was too late to do anything about it. There was less than 24 hours until the storm. I thought about sending Rommel or Sonny to Tacloban before the storm arrived—but there wasn’t time. I talked to everyone: Nanay, Tatay, Rommel, Ronny, Danny, Sonny, Eva, and Lina, plus my nieces Desiree and Rochelle who live with my parents. Finally all I could do was wait. The next day, I watched on the Internet and television as the forecast grew worse and worse. Winds of 195 miles an hour sustained, they said, with gusts to 225. The reports said it would be like an EF5 tornado—the strongest category of tornado— fifteen miles wide ripping across the center of the country. And my town of Guinob-an was right in its path. The storm reached Guiuan, a hundred miles to the east, early in the morning of November 8th. 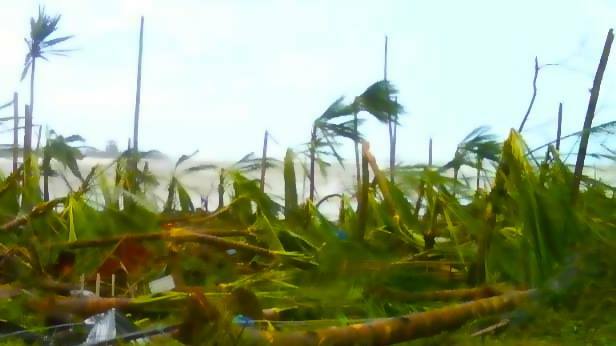 On the news, the story was that the weather station had recorded winds of ninety-six miles per hour, then had gone quiet and all the phones from Guiuan stopped working. Ninety-six miles an hour didn’t sound so bad. But they were saying there were sustained winds over 200 miles per hour—that 96 miles per hour had simply been the last reading before the equipment went silent. Just like that, contact had been cut off with Guiuan. Meanwhile my family, 100 miles to the west in Guinob-an, could still get through to me. The wind was growing stronger, stronger. Everyone was in the main house now—they had abandoned the other, fragile ones. The meteorologists were now predicting a twenty foot high storm surge. My parents’ house was at an elevation of no more than four feet above sea level, and was only one hundred fifty feet from the shoreline. All I could think of was that I could lose everyone—mother, father, sisters and brothers, nieces and nephews—all of them. The winds got stronger still. After that, I kept on texting them…with tears in my eyes. But no more texts arrived. That was Thursday. Friday night pictures and videos of the result of the typhoon in Tacloban starting to appear on social media and on TV and what I saw was so frightening I started shaking. All day Saturday, still no word from my family. Around me, all of the other Guinoban-anons (our word for natives of our town) living abroad were experiencing the same thing. There had been no word from anyone. We compared stories on Facebook and kept waiting for word, any word, of what had become of our town and our loved ones. By Saturday night the photos and videos were everywhere and they were horrifying. I was supposed to work Saturday night, and I reported—but I just couldn’t concentrate and asked to leave. I couldn’t sleep again that night—it had been three nights now, with just brief periods of sleep, but still sleep was impossible. I kept texting them every hour or so, knowing they couldn’t receive my texts, but I wanted them to know that I was really with them during the strongest time of the wind. Also, it helped me feel connected to them just to be trying to reach them. I thought about my life, and theirs. I had foolishly missed my annual trip home the last two years—it had been three years since I had been home. Money had been tight, and the trip is expensive. My parents were getting older now. Nanay is 78, Tatay 81. Why had I not gone? I thought of all 50 of my family members in our house. Would it hold up? Or had it collapsed? If it did, what would happen to them? I couldn’t stop the tears any more. It is who we are, and how we live—how we cope with what life throws at us. It is how we reach old age with a smile, and how we accept that life is never perfect. It gives us strength, and laughter; it cushions our falls, it makes us whole. It surrounds us with a sense that we are not alone, that we have each other. Without family, we are nothing. I thought of my father, strong and quiet, erect and strong at eighty-one, his teeth gone, his hearing failing, but with the heart of a lion. I love our life here in America. Life without them is unthinkable. The last time I was home, I took pictures of some of my nieces and nephews, and when I got back to Los Angeles I made a wallpaper for my computers out of the pictures. I sat for hours staring at it now while we waited, and waited, not knowing, as word came back of massive tidal surges and thousands of deaths. I thought of them huddled in our house, four feet above the I thought of them huddled in our house, four feet above the waterline and a hundred feet from the shore. All I could do was pray, and keep texting, and share my fears and hopes online with so many others who, like me, had loved ones in the path of the storm and had heard nothing. Please, Dear God, let them be alright.